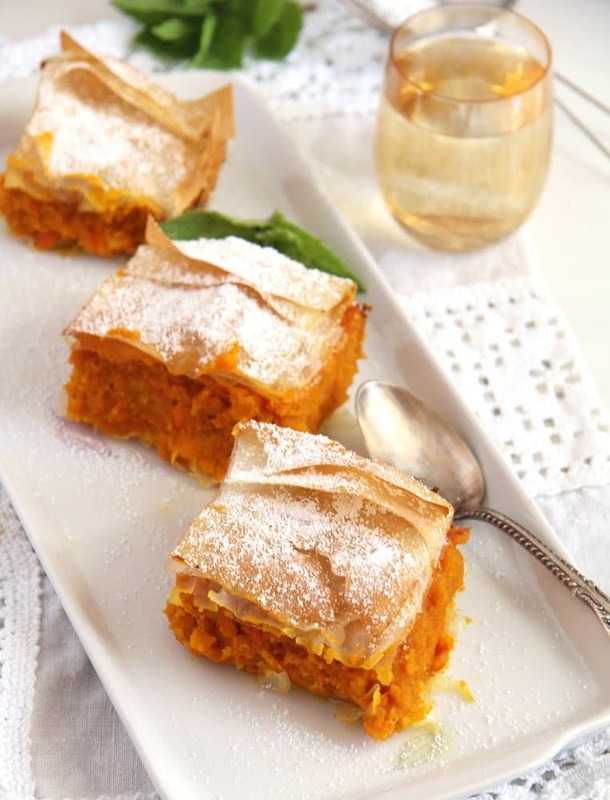 An easy to make, skinny and delicious pumpkin pie with cinnamon and phyllo or yufka pastry. My first pumpkin this season! I used half of it to make these Spicy Roasted Pumpkin Wedges and the rest to make this very healthy Pumpkin Cinnamon Pie. Just out of curiosity: after noticing that I only need one tablespoon of sugar for the recipe, I calculated the calories for it: a single serving of this delicious sweet pie has only 90 calories, which is pretty good considering that it is a pie, a dessert. Autumn has been very early in Germany this year, I could almost say it started in July and it feels like November now. We have 6 degrees Celsius/ 42 degrees Fahrenheit today. And I have just heard it on the radio that one year ago today we had 31 degrees Celsius/ 87 degrees Fahrenheit… Quite depressing! An endless autumn instead of summer and pre-Christmas weather in September… Maybe I should already look for the Christmas decoration on the attic. The bright side of it: the coziness in the evening, fire in the fireplace, bread in the oven and pumpkins. 🙂 One month ago I would have a hard time finding a pumpkin to buy and if I did it was totally overpriced, now they are just about anywhere already and at prices that makes them even more desirable. I have already bought the next one and I am planning to make this Pumpkin Ginger Soup again and these lovely Vegan Pumpkin Potato Casserole with Coconut Milk, which I am so sorry to say it is a recipe that remained almost unnoticed by the readers of WIMS and that is such a shame, it is one of the most comforting and tastiest pumpkin dishes I have ever made. And in case you are looking for more pumpkin inspiration, have a look at all of these recipes. This recipe is another one, which found its inspiration in the kitchen of Dobrogea, the Romanian territory found at the Black Sea and the Danube Delta. 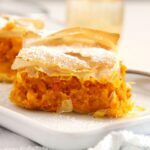 They make a delicious pumpkin pie there using another kind of pastry, I have seen versions with shortcrust pastry or homemade strudel dough. However, since I already had an open packet of yufka dough leftover from making Savory Cheese Pie with Quark, Feta and Yogurt and since I am really not into making strudel pastry myself, I thought I would make the pumpkin pie using that instead. Not to mention I was quite happy to use these low calorie pastry sheets instead of the shortcrust pastry, which I love, but which does contain a lot of butter. and it came out perfectly, I love those crunchy thin pastry layers and that thick, sweet and aromatic pumpkin filling. I did use yufka dough because like I have already mentioned in another post, yufka dough is very easily available in Germany. 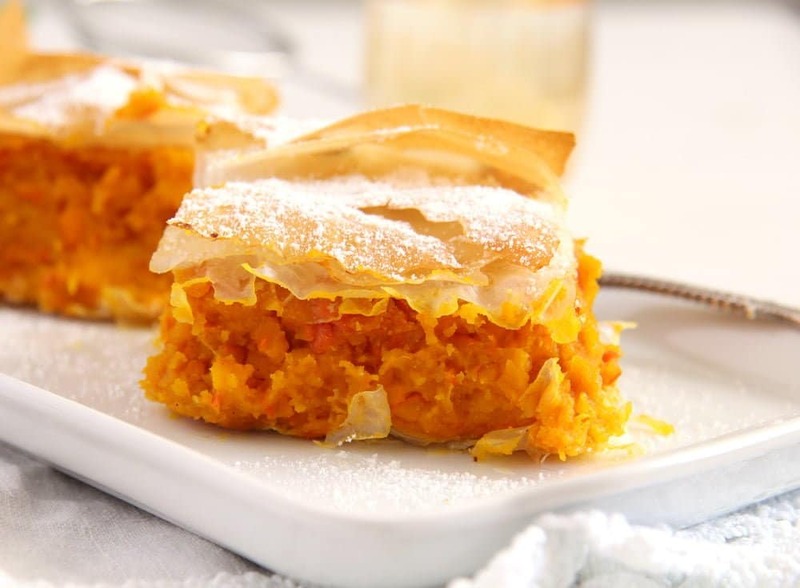 However, do use phyllo dough if you cannot find yufka, the difference will not be noticeable. I used Hokkaido pumpkin, which is my favorite sort of pumpkin. It is sweet, aromatic and it doesn’t have to be peeled. You could use butternut squash instead, but do peel that one first. The vanilla sugar can be replaced with granulated sugar and a bit of vanilla extract. Grate the pumpkin on the large grater or process it roughly in the food processor. If you use Hokkaido pumpkin, you don't have to peel it. If you use another kind of aromatic sweet pumpkin, do peel it first. Give the grated pumpkin to a medium saucepan, add the water, cover and let cook for about 10 minutes or until soft. Let cool. Add the vanilla sugar, cinnamon and 50 g/ 1/3 cup dry breadcrumbs to the cooked pumpkin and mix well. Give the oil to a small bowl or cup. Brush a small square cake pan 20x20 cm/ 8x8 inches with some of the oil. Cut each dough sheet in four pieces that are as large as the pan you use (See the note for more on this). Brush the first piece with a bit of the oil. Place it in the prepared pan and place the second one on top. Brush again and repeat with another two pastry pieces. Sprinkle the remaining tablespoon of breadcrumbs evenly on top of the last pastry sheet. Fill the pumpkin mixture and level. Brush the second batch of dough with the remaining oil and place one on top of the other to cover the pie. Brush the last layer of the dough as well. Bake the pie for about 25 to 30 minutes or about golden brown and rather crispy on top. You may dust the pie with icing sugar before serving, if you wish. You will need a total of four small layers of dough, four for the bottom layer of the pie and four for the upper layer. It doesn't really matter how large the dough sheets are, just keep in mind how many layers you need and cut the sheets to fit the pan. The dough sheets I had were so large that I only needed two of them, I was able to quarter each dough sheet and I had 8 smaller dough pieces in the end. 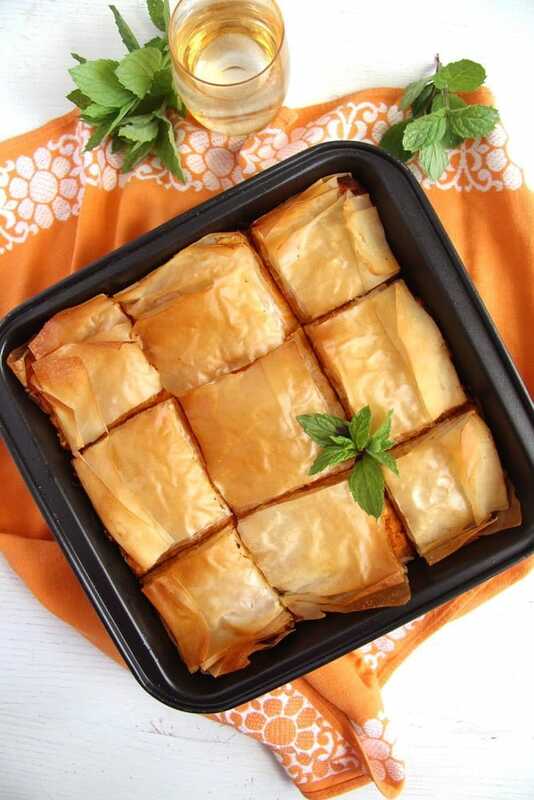 If your phyllo sheets are smaller you might need one or two extra sheets. I love filo pastry…so much skinnier than buttery pastry. This is a lovely sweet Fall treat. It’s pumpkin season. I’m yet to start baking with pumpkin, but I will make this pretty soon. My husband likes this pie, so I make it every year.